How do bruises happen? Well, they happen when blood vessels break near the surface of the skin (e.g., hitting your arm on something). As a result, blood leaks into the surrounding tissue, and a bruise appears on your skin. Bruises fade on their own in a matter of days. However, we all hate seeing them, and we want to eliminate bruises as quickly as possible. The good news is that there are ways to speed up the process. How fast a bruise heals depends mostly on the severity, but there are instances when bruises need more than few days to heal. That being said, I’m sure you’ll find one of the following remedies helpful when trying to get rid of a bruise. This is your first option. Arnica gel is part of the survival kit for every athlete, as it can reduce bruises, relieve aches, relieve a sprain, and much more. Thanks to its anti-inflammatory properties, arnica gel can reduce swelling as well. Even models in the fashion world use it. For minimal bruises, topical arnica is the best way to go; you’ll notice results in a few hours. Apply arnica gel or cream at least 3 times a day, and you’ll have nothing to worry about. Just wait a few hours before applying the gel again. A word of caution: the actual herb is poisonous. Therefore, never, ever, try to swallow raw arnica. The herb is for external use only. Ice treatment is something you can use for every skin problem, every pain problem, and so on. Ice helps constrict the blood vessels, preventing blood from leaking any further. You also get a numbing effect that soothes the pain. Wrap some ice cubes in a cloth and apply it to the affected area. You can even use some frozen food if you don’t have ice cubes. Hold it on the area for 15 minutes, and repeat after one hour. Ice treatment works only in the first 24 hours, in the initial moments after the bruising, when it will give you pain relief and reduce the inflammation. After that, switch to another remedy, preferably a warm compress. Cold and hot go hand-in-hand. While an ice compress is good during the initial 24 hours, a warm compress is what you do to relieve pain and bruises after that. A warm compress reduces discoloration and speeds up the healing. You can apply a warm compress by soaking a cloth in warm water and then applying it on the affected area. For almost any problem you’ll encounter, you can find an essential oil to fix it. 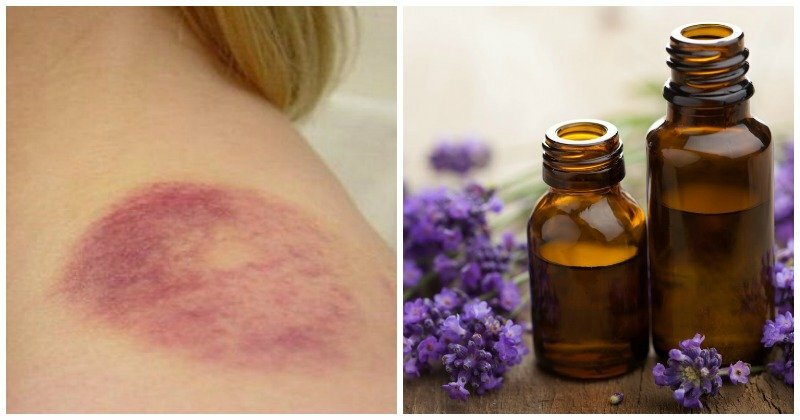 Massaging the area with essential oils is an age-old trick to treat bruises and many other skin conditions. A massage helps to improve blood circulation, which is the key element in treating bruises. Word of caution: try this treatment only if can find a farm-raised leech that is free of disease. A holistic medicine supply store or a Chinese medicine store probably has such live leeches. Apply the leech to the bruised area, and it will soak up the blood in a matter of seconds. The saliva of the leech serves as a painkiller, and you won’t even feel the bite. After the leech has done its job, rub some alcohol on the spot to remove it. Now we’re getting into the herb part of the bruise-elimination menu. Parsley leaves are one of the most common ingredients we can use for bruises. Parsley is rich in vitamin C and vitamin K, two vitamins that reduce inflammation and reduce pain. Just cut some parsley leaves and apply them to the affected area. The skin will absorb the ingredients from parsley leaves in a matter of seconds, and in a day or two, the bruises will be gone. Another herb that can help with bruises is watercress. We all use it for sandwiches, but little do we know that there was a time watercress was dubbed “the cure of cures.” Hippocrates gave watercress the ultimate stamp of approval thanks to its anti-inflammatory properties. Like parsley, watercress is rich in the two essential vitamins for bruises: K and C.
To get rid of bruises, crush some of the herb and spread it on the affected area. You can apply the treatment two times per day. Notice a pattern? Many ingredients we use for cooking can also be used for healing bruises. Butter is the next item on the menu. Again, it comes down to its anti-inflammatory properties, and there are studies showing butter can be used in medicine for treating skin problems. Just apply some fresh butter on the bruise, massage it gently, and let it work its magic. When it comes to skin problems, people usually think of raw cucumbers, especially for circles around the eyes. But a raw potato has the same effect. Cut the potato into slices, and apply them to the affected area. You can even use shredded potato on the bruise. When you think of traditional home remedies, onion is at the top of the list. You have probably heard about the onion’s anti-inflammatory properties. But there are right ways, and wrong ways, to apply onion on bruises. The first, and simplest, one is to take a raw onion, cut it in slices, and then apply the slices on the affected area. Let them stay there for 30 minutes, and then wash the area. The second method is more complicated, but also more effective. This time, you need to cut the onion into small pieces. Put the onion pieces in a small bowl and add two teaspoons of salt. Grind them together until you get a paste. Apply the mixture on the bruise, and then wrap it with a towel. Let the solution stay on the bruise overnight, and enjoy the benefits in the morning. Rich in antioxidants like flavonoids and vitamin C, blueberries are extremely beneficial for the skin and skin conditions. Eating blueberries will make you look younger, as your skin will keep its elasticity and slow down the aging process. When you need to get rid of bruises, eat some blueberries and let them work their magic. You can also combine blueberries with any of the remedies mentioned above. Now I know there are people who love chocolate, and this remedy will a delight for them. As many of you know, chocolate contains cocoa compounds. But what you probably don’t know is that cocoa has anti-inflammatory properties. It is one of the reasons why women love chocolate when they have menstrual pain. To eliminate bruises, melt some chocolate (dark chocolate, preferably) and apply it to the area. Just make sure that the chocolate is not too hot when you apply to the area. Similar to blueberries, eating pineapple reduces the symptoms of bruises thanks to a natural component known as bromelain. Swelling and irritation will be gone in a matter of minutes after eating pineapple. In addition to vitamin C and vitamin K, cabbage is also rich in potassium, a mineral that helps with blood pressure, blood vessels, and everything blood-related. You can apply cabbage in two ways. The simpler way is to grate some cabbage and apply to the affected area. The second, and the more complicated way, is to immerse the edges of the cabbage leaves in hot water. After immersing, apply the leaves on the affected area. I must say, I almost forgot vinegar. But there is no denying that vinegar is one of the best, most famous, and most commonly-used remedy for bruises. Bruises clog the blood cells, and vinegar breaks up the clogging. Applying vinegar increases the blood flow in the affected area, which in turn speeds up the recovery process. Just be careful: do not apply raw vinegar on the spot. Mix it with some warm water, and then apply on the area. As I’ve mentioned several times, vitamins C and K are essential to healing bruises. Add them to your diet to speed up the process. I don’t recommend supplement form; instead, eat leafy greens, broccoli, citrus fruits and other foods rich in these vitamins. I would like to finish the list with one of the citrus fruits I mentioned. Yes, consuming lemon will help bruises heal. But for a quicker fix, apply lemon juice on the affected area, and massage it gently for five to ten minutes. Rest as much as you can to relax your muscles. Go to bed early, as you need sleep to allow your body to fight off the bruises. Do not, under any circumstances, take aspirin. Elevate the bruised area by stacking pillows. Elevation prevents blood from pooling around the affected area. Massage the area, not just with remedies that require massage, but with your bare hands. This will improve blood circulation around the affected area. Do not, however, massage the center of the bruise. When combining warm and cold compresses, make sure to let two hours pass before switching from one to another. Expose the bruises to sunlight at least 15 minutes per day. Sun exposure helps bruises fade faster. Should You See a Doctor?